My ‘Stores’ dimension is a bit complex because I have some that are open on weekend days, and some that are not. 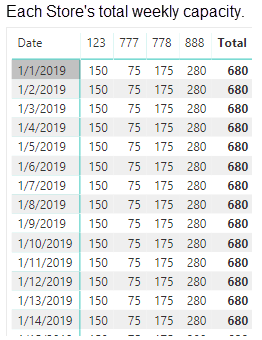 What I want to calculate is the total capacity for each store over a given date range, and be able to drill up/down to a daily or weekly level, with it calculating the correct value for a week period whether the particular store is operating on the weekend or not. Can you load some sample data and maybe a quick mock-up of what you would like to see? here is some sample data I have mocked up, the stores tab is the dimension, the plans tab is the fact table. the relationship here is the PlantID. The date dimension is related to the Fact table by the PackingDate field. as far as a mockup goes, it want to use the capacity aggregation multiple ways, but here is an example of what is planned vs the combined capacity of all the Plants/Stores currently being shown. Two images of the same visual, where one has been drilled down further in the heirarchy of dates. i.e. if the store isn’t operating on the weekend, its weekly capacity would be 5 * Capacity, instead of 7 * capacity like I’m getting. Quick question. I’m not 100% clear in your sample data where the capacity is. 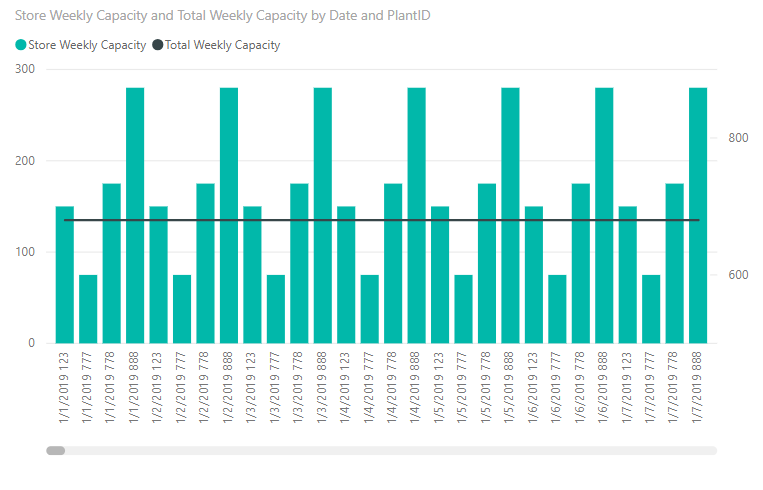 Is it the weekly capacity in the DimStore table under the PackingCapacity column? I just want to be sure since this will be the starting point for the calculation. The field ‘PackingCapacity’ in the stores table is the Daily Capacity - hmmm, what if we worked out the weekly capacity into that dimension table, and then switched between the daily and weekly values depending on the date context? Did you manage to work out a solution? Sorry about the delay, actually had my first kid a little earlier than anticipated so had to go radio silent there. I will have some sort of solution by end of week at the latest. Thanks for the congrats, appreciate that! Now back to business. I attached the pbix file below. I dont think its 100% what you want, but I think ( hope) it is close or at least something we can work with. A query called PreventFirewall. Probably not an issue here, but sometimes you can get an error if you dont have the correct access to source data. Basically this query gets everything from the excel file and then the FacPlans and DimStores table referenced that. I’m sure this is more that is needed here, but this should be a good start. thanks for this - I’ll have a look and let you know if I can make it work! I’ll be around these parts, so let me know when/if you have any questions.